LIFE has just published a new book, "Remembering Jackie: 15 Years Later. One of Mark Shaw's photographs graces the cover, many more are inside. The book is by the editors of Life with an introduction by Hugh Sidey. 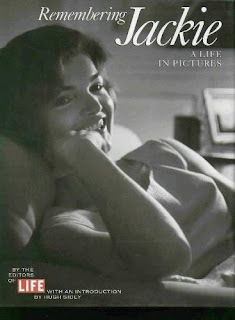 It features over 100 nostalgic photos that tell the story of Jackie's life from a daughter of Janet and "Black Jack" Bouvier to a striking debutante who captured the heart of a young handsome U.S. Senator Kennedy. Among the featured photographers are Carl Mydans, Alfred Eisenstaedt, Stan Stearns, Lisa Larsen, Bob Gomel, and Eddie Adams. It shows the White House years and President Kennedy's assassination and funeral. There are also many photos of John and Caroline, two famous photos of John: looking out at his fathers desk in the white house, and saluting his father as the funeral procession goes by. It follows with photos of Jackie and Aristotle and her life in New York as a book editor. It has Jackie's own words and quotes from those who knew her, and it ends with people signing the guest book at her services. It also show all 18 covers of life magazine that she appeared on. The book is widely available now, and Life.com has a special photo slide show on-line. The current Mark Shaw Retrospective exhibit is entering its final weeks. Already the subject of several local reviews and articles, it will be a featured review in the summer issue of ARTNEWS. Mark Shaw lived from 1922-1969. As a photographer he is perhaps best known for his images of Jacqueline and John F. Kennedy and their family which he originally photographed on assignment for LIFE magazine, and later as their family photographer. Also a leading fashion photographer, Mark Shaw worked for Harper's Bazaar, Mademoiselle, and a host of other fashion magazines. He started working for LIFE magazine in 1952 and in 16 years shot 27 covers and almost 100 stories. Throughout the 1950's and 1960s' Mark Shaw shot the European fashion collections for LIFE, and was one of the first photographers to shoot fashion on the runways and "backstage" at the couture shows. Decades after his death, Mark Shaw’s photographs are now being exhibited collectively for the first time. The exhibition continues through June 28. Opening July 3, "A Thousand Words: Masters of Photojournalism". Memorial Day, originally called Decoration Day, is a day of remembrance for those who have died in our nation's service. All to often we celebrate it more as the start of summer. 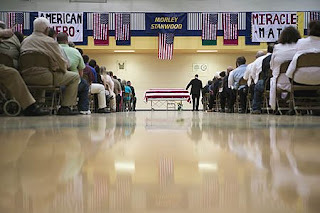 In a reversal of an 18-year-old military policy that critics said was hiding the ultimate cost of the wars in Iraq and Afghanistan, the news media has just recently been allowed to photograph the coffins of America’s war dead as their bodies are returned to the United States, but only if the families of the dead agree. Tami Silicio was the first person to challenge the ban. Photojournalist Eric Smith, as part of a project documenting the war's impact on his local Michigan community, has been photographing funerals for Iraq veterans, but with another purpose. Photojournalist Eric Smith has gone in search of Middle America, which he defines as the people living in the nation’s small towns and the less-than-glamorous cities far from the coasts. “Middle America drives our economy, defines popular culture, and fights our wars,” Smith said during a recent phone interview from his home in Auburn Hills, Mich. He insists that without the interest of people who live far from major urban centers, Britney Spears would have been quickly forgotten. Smith isn’t an economist, and he admits that perhaps he’s wrong about the cultural impact of the spending power of small towns. But an Associated Press study has confirmed his belief about their importance to the Iraq war: half of U.S. troops killed in Iraq came from communities with fewer than 25,000 people. And one in five soldiers hails from a town with fewer than 5,000 residents, according to AP. In Michigan’s towns Smith witnessed the funerals of U. S. soldiers killed in Iraq; the Rev. Fred Phelps and his congregation from the Westboro Baptist Church in Topeka, Kan., who picket the funerals of dead soldiers and hold signs with crude messages expressing their belief that U. S. troops die because an avenging God is angry with America’s tolerance of homosexuality; and thousands of men and women who roar into those towns on Harley-Davidson motorcycles to pay respect to their fallen heroes. The clash of beliefs Smith witnessed at those funerals spurred the photo project In America — The War & Patriotism. Sidney and Michelle Monroe, owners of Monroe Gallery of Photography, saw Smith’s In America — War & Patriotism and Middle America images during a portfolio review sponsored by the Center for Photography, now known simply as Center. Smith is the first new artist the gallery has agreed to represent in several years, Michelle Monroe said. The Monroes felt his work builds on the humanist traditions of the gallery’s more established artists, such as Berenice Abbott and Gordon Parks. Two of Smith’s photographs are included in Speak Truth to Power, which runs through Sept. 23 (2007); more hang in an alcove in back of the main gallery. While Smith’s Middle America captures moments most Americans will easily recognize as examples of our diversity — a woman installing a National Rifle Association display at the Lenawee County Fair in Adrian, Mich.; the white hearse at Rosa Parks’ funeral in Detroit — War & Patriotism may leave people feeling as if they are looking into a distorted mirror or a parallel universe. “I started following an organization called the Patriot Guard Riders,” Smith said. “ They are all bikers; most are Vietnam veterans.” About three years ago members of the Patriot Guard Riders started showing up at military funerals to create a barrier between the families and friends of troops killed in Iraq and Afghanistan and members of the Westboro Baptist Church, who were picketing those funerals with signs that read “America is doomed” and “God hates fags.” Most American Christians might believe that God loves everyone, but Westboro’s Web site posts a 94- page manifesto that calls that belief “ the greatest lie ever told.” At military funerals, members of the church have greeted mourners with sneers and hateful rhetoric, and that, Smith said, has touched a raw nerve in many Vietnam veterans. For members of the Patriot Guard Riders, creating a barrier out of flags and their own bodies is cathartic, Smith said. “They do not want these kids treated as they were treated — spit on and harassed. For a lot of these guys, this is a response to the treatment they received more than 30 years ago.” In his photographs, Smith has captured moments when the spit and polish of military honor guards has found common ground with white-haired, bearded, leather-clad bikers. Eric Smith's photographs of the abandoned Michigan Central Train Depot are featured in the Museum Of Contemporary Photography (Chicago) exhibit through July 5. HONG KONG — Hubert Van Es, a Dutch photojournalist who covered the Vietnam War and took one of the best-known images of the American evacuation of Saigon in 1975 — people scaling a ladder to a helicopter on a rooftop — died here on Friday. He was 67. The Foreign Correspondents’ Club of Hong Kong announced his death on behalf of his wife, Annie. Mr. Van Es fell into a coma a week ago when he suffered a brain aneurysm. He died on Friday at Queen Mary Hospital. Mr. Van Es was in the offices of United Press International on April 29, 1975, when he saw about 30 Americans on the rooftop of an apartment building several blocks away climbing a long ladder to board a Central Intelligence Agency helicopter. Mr. Van Es, known as Hugh, took the photo using a long lens and sent it out over the U.P.I. wire service. The building in the picture housed C.I.A. officials and families, but in reprintings it has often been described incorrectly as the American Embassy in Saigon. 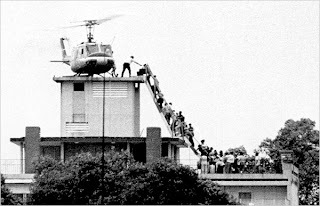 Thousands of people were evacuated by helicopter during the fall of South Vietnam. The photo became one of the war’s defining images. Mr. Van Es took other memorable pictures of the conflict, like one of a wounded soldier, a cross gleaming against his silhouette, from the battle of Hamburger Hill in May 1969. He gained a reputation for fearlessness. But for the rest of his life he was known primarily for that image from Saigon. “He was obviously a very good photographer, but what he did was to capture the end,” said Ernst Herb, the president of the correspondents’ club. Born in Hilversum, the Netherlands, Mr. Van Es decided to become a photographer after seeing an exhibition of the work of the renowned war photographer Robert Capa. He arrived in Hong Kong as a freelancer in 1967, joined The South China Morning Post as chief photographer and initially went to Vietnam the following year, after getting a job as a sound man for NBC News, according to The Associated Press. After a stint with NBC, he joined the A.P. photo staff in Saigon from 1969 to 1972 and then covered the last three years of the war, from 1972 to 1975, for U.P.I. When he took the Saigon picture, Mr. Van Es was in the process of leaving U.P.I. to become a freelancer again. Based in Hong Kong after the war, he also covered the Moro rebellion in the Philippines and the Soviet invasion of Afghanistan. Mr. Van Es was dismayed that he did not receive royalties from the use of the Saigon photo, which belonged to U.P.I. The rights have since been sold twice, along with many other photos taken by the wire service’s photographers. Bill Gates, co-founder of Microsoft, now owns the rights to the photo through Corbis, a company he created. Besides his wife of 39 years, Mr. Van Es is survived by an older sister in the Netherlands, said Kees Metselaar, another photojournalist based in Hong Kong. Joanna McCarthy and Larry Silver. The International Center of Photography has digitized thousands of previously unseen Spanish Civil War photos by legendary photojournalists Robert Capa, David “Chim” Seymour, and Gerda Taro. The preservation effort was one of the final projects of Cornell Capa, Robert’s brother and the founder of ICP, who died in 2008. Also instrumental in getting the negatives into the hands of ICP was Richard Whelan, a Capa biographer who died in 2007. The three cardboard boxes of negatives—nicknamed the “Mexican Suitcase”—contained some 4,300 frames. Researchers attributed about a third of the pictures to each photographer. Additionally, there were two rolls of portraits of Capa and Taro attributed to photographer Fred Stein. Through a chain of sometimes murky transactions, the Mexican Suitcase photos made their way from Capa’s Paris studio (where Capa left them when he fled the city in 1939) into the hands of Mexican filmmaker Benjamin Tarver in the 1990s. ICP managed to obtain the negatives in December 2007. ICP says no money changed hands. The collection is not an exhaustive archive of the trio’s Spanish Civil War coverage, and does not contain any negatives of Capa’s “Falling Soldier,” among his most famous images, and the subject of a long-running debate over whether it was staged. However, the work is providing historians with insights into how the photographers worked and where they traveled.Capa and Chim were founding members of Magnum Photos. The Spanish Civil War was a defining moment in photojournalism, and these three photographers earned their reputations by venturing close to the front lines. All three of the photographers were eventually killed in action. Taro, Robert Capa’s partner, died in 1937 after being struck by a tank in Spain. Robert Capa was killed by a landmine in Southeast Asia in 1954. Chim was killed by Egyptian machine gunners in 1956 covering the Suez crisis. An interview with Michelle Monroe of Monroe Gallery of Photography will air on KPFK radio (Los Angeles) Wednesday, May 6 at 12 noon Pacific time. The interview will be simultaneously available by webcast. Treasures of the West host Pam Wilson interviewed Michelle Monroe in the gallery about Monroe Gallery's dedication to exhibiting photojournalist's work and the current Mark Shaw Retrospective. Mark Shaw, who lived from 1922-1969, is perhaps best known for his images of Jacqueline and John F. Kennedy and their family which he originally photographed on assignment for LIFE magazine, and later as their family photographer. Additionally, Shaw worked for LIFE magazine beginning in 1952 and in 16 years shot 27 covers and almost 100 stories. His photographs of Audrey Hepburn, originally shot for LIFE in 1953, had been lost after Mark Shaw’s death, and were only found in 2005. (This May 4th would have been Audrey Hepburn's 80th birthday). Also leading fashion photographer, Mark Shaw worked for Harper's Bazaar, Mademoiselle, and a host of other fashion magazines. 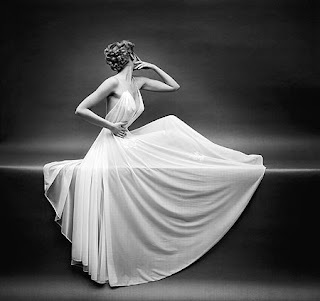 Throughout the 1950's and 1960s' Mark Shaw shot the European fashion collections for LIFE, and was one of the first photographers to shoot fashion on the runways and "backstage" at the couture shows. KPFK, based in Los Angeles, was the second of what would eventually become five Pacifica Broadcasting Stations to go on the air. Started in 1959 with an enormous transmitter in a prime location, KPFK is the most powerful public radio station in the Western United States. WCVB TV, The Boston Channel, has just posted a great slide-show of photographs by Pulitzer-Prize winning photojournalist Stanley J. Forman. Stanley J. Forman is an accomplished photographer with more than five decades dedicated to his craft. Forman's career is marked by work for media throughout the Greater Boston area, filing for the print dailies, weeklies and wire services. His 1976 Pulitzer Award for The Boston Fire was the first of three; Forman also won the award in 1977 for Spot News Photography, for documenting a youth using the flag as a lance during street disorders, and in 1978, Forman was part of the Boston Herald American staff which won the Pulitzer for Feature Photography of that year's blizzard. On winning the first of his Pulitzer Prizes, Forman was pragmatic in knowing that his work resulted in tougher fire codes. "I daydream about making pictures that have the impact that those pictures had," he says. Forman has worked as a cameraman at Boston TV station WCVB since 1983. 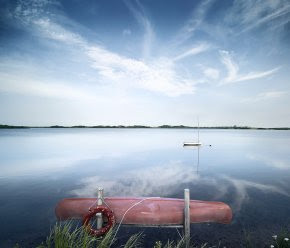 Monroe Gallery is honored to represent his photography. Iconic actress Audrey Hepburn, who charmed a generation of moviegoers with her unique style and grace, would have turned 80 this May 4. There are several events and film screenings scheduled world-wide to celebrate Audrey Hepburn's life. Her family, friends, the Audrey Hepburn Children's Fund, and UNICEF will commemorate this occasion with the presentation of The Audrey Hepburn Humanitarian Award given in recognition to those who work to aid children throughout the world. This year's recipient is Irena Sendler, a former Polish Resistance Fighter who was responsible for saving 2,500 Jewish children during the WWII German occupation of Poland. On May 3, the Audrey Hepburn Children's Fund will host a screening of "Taare Zameen Par" (Every Child is Special) in Berlin. Sean Hepburn Ferrer personally contacted the star Aamir Khan to invite him for a special screening of the film. Monroe Gallery of Photography is featuring a major retrospective exhibition of photographs by Mark Shaw through June 29, including many images of Audrey Hepburn. Photographed on assignment for LIFE magazine in 1953 during the filming of Sabrina, the negatives were only found by the photographer's son David Shaw in 2006. Included in the exhibit are several rare vintage prints. A new book of photographs of Audrey by Mark Shaw has just been published, "Charmed by Audrey", available in bookstores everywhere. 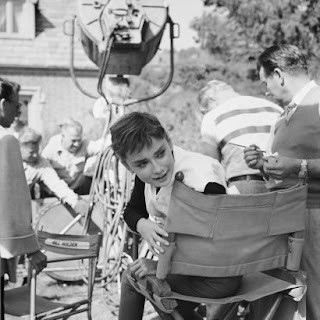 There are numerous screenings of Audrey Hepburn's movies scheduled across the United States and abroad, check your local city listings.